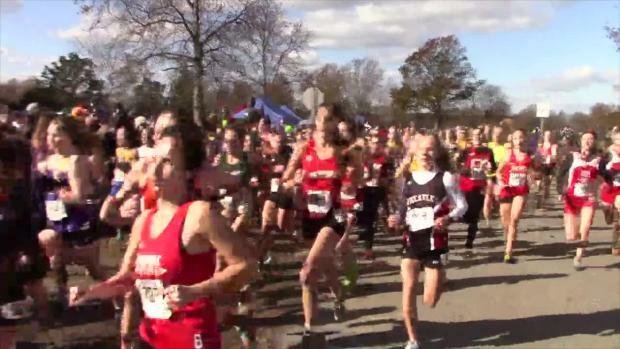 Training on the hills and mountains of Upstate New York (and we mean Upstate) may be an advantage for the Saranac Central High School in the Summer, but come late fall, the snow and cold begin, and the training for these runners has to adapt. Such is the life of a School in Section 7, nestled right between Canada and Vermont. Some athletes might be scared off by the prospect of training in some of the coldest conditions in New York State, but for those dedicated to Track & Field, the name of the game is to modify and adapt to your training realities. Rachael Woodruff is one such athlete. A member of the Saranac Cross Country Team for five years (four years for track), Rachael had a remarkable Cross Country culminating with a 4th Place finish in Class C at the New York State XC Champs. Her 5K Cross Country PR is an impressive 18:08. Her most memorable moment in running came last Spring during the 2018 Track season, in which her 4X800 relay team broke the 26 year Section 7 Record with a time of 9:40. While she admits the time is not as fast as most other records in the State, she tells us that "the feeling of crossing the finish line, seeing the time on the clock and then celebrating with my teammates, is something that I will never forget." And again, the record becomes more impressive, once you delve into the training necessitated for its production. 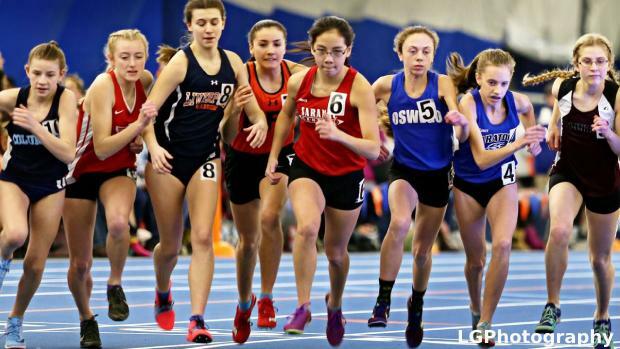 Coming into this indoor season, her coaches have tried to extend her cross country training in the hopes of getting some qualifying marks, with the ultimate goal being the 5K at New Balance Indoor Nationals. At the Dartmouth Relays she turned in a very impressive mile PR of 5:11. Then just this past weekend, she ran another PR at the Utica College Invitational with a 10:25 for 3000m, finishing 4th, in a talented field. 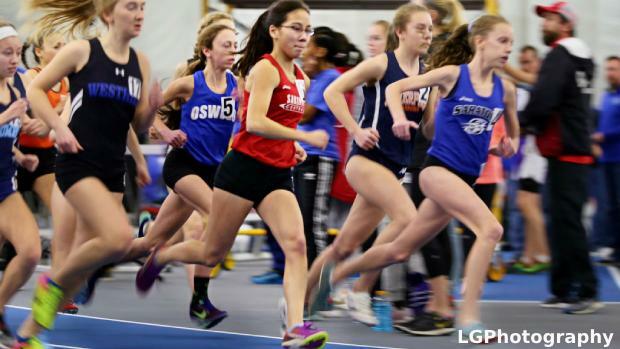 If you think it's daunting running 3000 meters on a 200 meter indoor track, Rachael usually runs in the only indoor facility Section 7 has... a 160 meter indoor track with 4 lanes located at SUNY Plattsburgh. 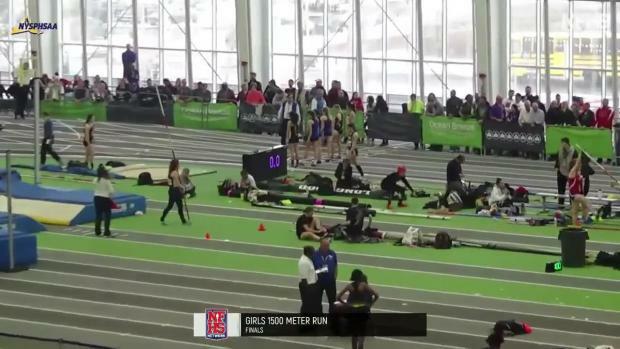 Even so, she managed to run 10:28 on that track in a solo performance. "Because of our remote location, it's difficult to get quality meets" says Coach Jim Medeiros, who's served as the Varsity Coach for Cross Country and Track for 29 years at Saranac. With only 8 other teams in the entire Section, each with their own training limitations, competition at the higher levels can also be limited. Medeiros attributes Rachael's competitive success to the fact that "we always try to schedule to attend bigger invitationals where the competition will be greater. Rachael is a very easy person to coach. She is very humble and works very hard. She does everything she's asked to do and more. Rachael is a great teammate and never backs down from a challenge." Saranac's biggest challenge comes from the snow, and the training problems it creates. With some of the highest snowfall totals in the State, running on the roads can range from treacherous to dangerous. For Coach Matt Medeiros, son of Head Coach Jim as well as the distance specialist on staff, there came a point where it was no longer a viable option. "Matt has brought snowshoe running into the training program during the winter months" says coach Jim. Matt had personally been a snowshoe runner for 12 years now, and thought this would be an excellent way to make do with what you have, so to speak. "About 3 to 4 years ago, I brought this into our training program for the winter months to get us out of the halls." says Coach Matt. "We have to stay on school grounds or go to a facility that has miles upon miles of packed trails so we can get miles in on weekends and breaks." For the snowshoe runs, they make their own 300 meter track in a field at the school, packing it down each lap around so that after a few laps it is "actually nice to run on." says Rachael. They also utilize some of the local trails to change it up and make it more interesting. "I like snowshoe running because it is unique, helps with form, builds strength, and provides a nice break from the normal runs" says Rachael. Rachael and her teammates still end up doing a lot of running in the halls, and down the one road that they are allowed to use due to the size of the snowbanks in the winter. A couple days a week they might even include aqua jogging or treadmill runs. "Sometimes we spend a portion of the practice shoveling a lane on the outdoor track so we can get a workout in" says Rachael. Several years ago the coaches started a day of training that strictly focuses on core work. "We do this year round," says Coach Matt, "In doing this, it gives the kids an easy day, yet they are still getting in a workout. 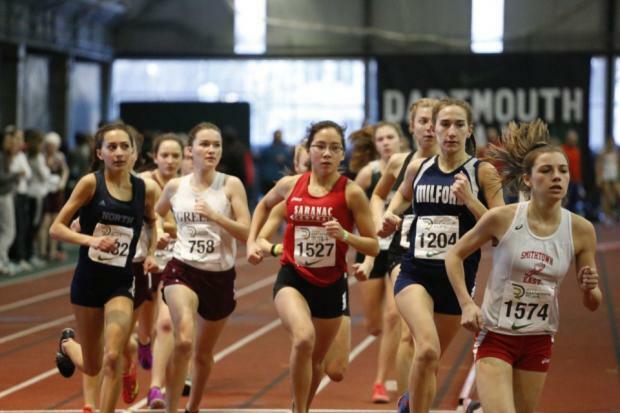 Ultimately, they can't do much training during the winter months and they use the indoor season to work more on speed after building such a great base during the Cross Country season." Matt added, "I think also using our league meets as workouts in preparation for the bigger invitationals where Rachael will have more competition, has proven beneficial." Only a junior, Rachael is the teams top distance runner. Regardless, the Coaches have great admiration for her leadership on the team, "Rachel is a great leader who always goes above and beyond with her training, always asking what she can do to be a better runner." Off the track, Rachel is top in her class, Class Secretary, Key Club president, a member of the Adirondack Skating Club (advanced level), and plays the French Horn. "So she does very well with time management and not missing her track workouts," says Coach Matt. With an already impressive season shaping up for Rachael, her coaches are looking ahead to Championship season where at Sectionals "points are going to be vital" says coach Matt. After sectionals, they will have to decide what her best options are for States. 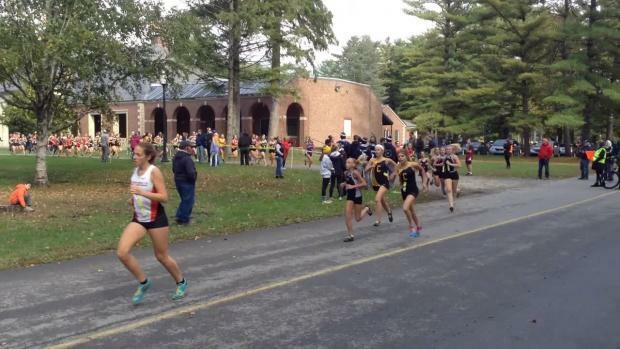 "The last tune up prior to States will be a race at the Eastern State Meet down at the Armory." "My coaches have inspired me through their own successes in running, as well as their continued lifetime enjoyment of the sport," Rachael said. "Through their incredible work ethic and passion for running, they inspire me to accept new challenges and take advantage of every opportunity. I am so thankful for everything I have learned and will continue to learn from my coaches." The greatest take-away Rachael has from her coaches is, "the value they place on the team aspect of running. From the moment I joined the program (5 years ago), I was surrounded by the most supportive, hard-working group of people I had ever met. In 20 years, I may not remember every PR I had in high school, but I will remember running with my teammates and sharing countless experiences with them."